This paper was given during the XIII Congress of the European Society of Ophthalmology, SOE2001 (SOE=Societas Ophthalmologica Europaea) in Istanbul in June 2001. It was a part of a Low Vision Seminar where also other aspects of Impaired Vision were covered by colleagues from several European countries and the US. When updated 12 years later the situation is nearly the same in many countries: infants with delay in the development of visual communication and interaction are not assessed for their weak accommodation that causes blurred vision and prevents the infant from seeing visual communication. This problem would be easy to treat by giving the infant near correction spectacles (reading glasses) so that the image on the retina would be in focus. Parents of infants with the diagnosis “visual processing disorder” (CVI in the USA) may even hear that these children do not benefit from spectacles, “glasses may make their vision worse”. This statement is wrong. Following it may disturb the infant’s early communication and learning so that they never reach the level that they would with proper care of vision. 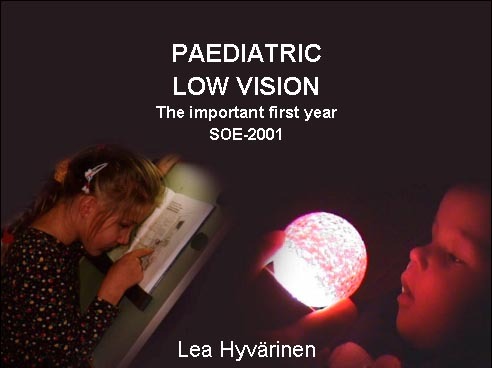 The phrase "developmental emergency" was first used by Patricia Sonksen, pediatric neurologist specialized in developmental medicine at the Wolfson Centre in London to describe the need of immediate care of an infant and the family in case of diagnosis of low vision during the first year of life. More than 60 % of visually impaired infants have at least one other impairment or chronic illness, many have several impairments that make the basic care complicated, time consuming and prevent the parents from enjoying the care of their child. Often operations are needed with time spent in the intensive care unit. Small prematurely born infants may spend months in intensive care with little interaction with the parents. Repeated examinations bother the infant and make the parents see their child more as a medical problem than their infant. Disturbance in interaction is worsened if the infant does not have normal eye contact with the parents. If visual impairment is suspected in an infant with no other problems, usually at the age of 3-4 months because of delay in visual development, it is important to support the early interaction, to "help the parents to fall in love with their infant" (as Patricia Sonksen put it) before the visual impairment begins to affect early interaction even more. Parents need counselling by an experienced worker who can describe the response patterns of a visually impaired infant and can demonstrate how to observe the signs of interaction when visual input is low or distorted. As seen in this picture of Anne Nafstad and Ingrid Rødbroe, vision usually plays a central role in early interaction. Facial expressions and body movements are perceived visually and are the basic information for understanding each other, not only between mother and child but between all adult persons and the infant. An infant uses all sensory information in interaction. In the early weeks of life, smell, voice and being held by an adult are important in recognising persons. From the age of a few weeks vision starts to play a central role in communication. If the use of vision deviates from normal, it needs to be explained to the parents and medical personnel. In this case the infant has colobomas in both eyes and the maculas are pulled from their normal location. When the infant is looking at the adult person's face, he seems to be looking above the hairline, which is experienced negative if the cause is not known by the adult. This infant was also nearly deaf so communication was supported by using tactile information from lips and vocal cords (TADOMA technique) with the hope that the infant would learn to connect the poor quality auditory information with the visual and tactile information related to speech. At this early age tactile information does not convey words, only awareness that something is going on in the mouth region and that is related to interaction. This infant's contrast sensitivity was very low, only the 100 % and the 25 % picture of Hiding Heidiresulted in a response at a distance of 30 cm. A normally sighted person sees the 1.2 % picture at a distance of nearly ten meters. This meant that contrast on the face of the mother and father needed to be increased by make-up and by using optimal luminance levels. Hiding Heidi test contains pictures of the Heidi face at 100 %, 25 %, 10 %, 5 %, 2.5 % and 1.2 % contrast. The test is used within the visual sphere of the infant/child and presented by moving the blank card and the picture card in opposite directions. The test can be used as soon as the infant is able to follow the movement of the test grating and then fixate on it when the movement stops, usually at the age of three months. When assessing 'Vision for Communication' contrast sensitivity is one important function to measure because much of communicative information is at low contrast levels. The faint shadows on the face that convey expressions are low contrast information, especially on the very fair Nordic and on very dark faces. If contrast sensitivity is low, contrast needs to be enhanced by make-up, lip liner (the brown lip liner can be used by men as well as women), eyeliner, spectacles etc. Refractive errors should be carefully measured in all cases of visual impairment or when there are problems in early intervention. High myopic and hyperopic infants have use for their spectacles from the age of three months. There are often difficulties in finding well fitting frames, it may require searching in several optician's shops. Assessment of accommodation takes very little time. An accommodative target, a bright coloured toy with high contrast details is kept next to the retinoscope while measuring the refractive error before the accommodation is relaxed with cycloplegic drops. If the infant fixates on the object, the reflex of the retinoscope light from the retina changes toward myopia. If accommodation is exactly at the level of the retinoscope, movement in the reflex disappears so it is easy to recognize. Most often infants underaccommodate some, which can be measured by keeping the toy at the chosen distance while moving the retinoscope backwards until the reflex movement disappears. 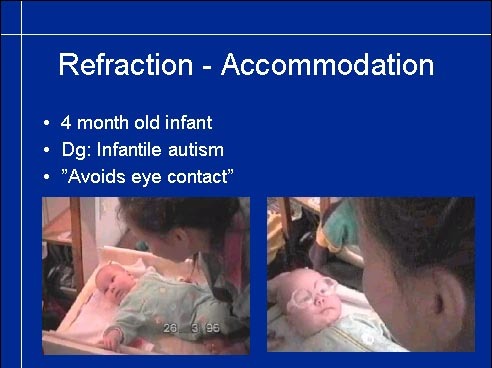 If an infant does not accommodate, there is no change in the refractive state. Failure to accommodate may be caused by not being interested in the target or by attentional defects. In both cases testing with plus glasses that give a clear image on the retina of the infant is advisable. The power of the lenses is the basic refractive error + approximately +3.0 if the communication distance is 30 cm. This infant had had infantile spasms and therefore had been treated with ACTH and seizure medication for months and had a low level of wakefulness. During the first assessment the infant did not wake up at all. During the second assessment the infant woke up but did not look at any of the test toys used. Since she did not seem to accommodate at all, glasses were tried. She was hypersensitive in her face so the frame irritates her when put on but is tolerated when on their place. After a few seconds the infant looked surprised and clearly fixated her gaze on my face with a normal looking eye contact. - When I moved the glasses on her forehead she frowned and when the glasses were again placed in front of the eyes, she became quiet and attentive. This technique of removing the correction for short intervals when the infant is looking at something of interest, may initiate accommodation in some cases, although many of these multi-impaired infants never develop normal accommodation and accommodation-convergence relationship and thus are likely to develop strabismus. Development of accommodation may be delayed in infants with otherwise normal neurological findings. In this case the infant is the fourth child in a family where two of the older siblings have esotropia. At the age of four months she was diagnosed as having infantile autism because she 'avoided eye contact'. Since she did not seem to be able to accommodate, glasses were tried also in this case. The infant looked a few seconds puzzled, then had normal eye contact with the mother and immediately after that a normal social smile. This video sequence clearly demonstrates the importance of accommodation in eye contact and in early interaction. 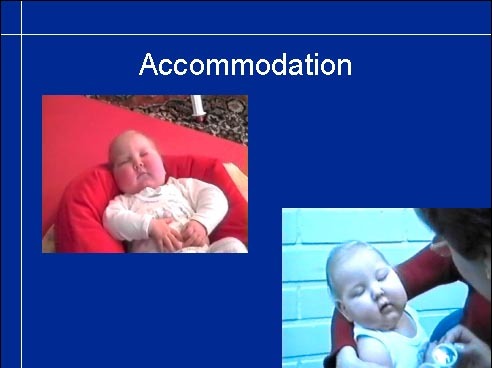 Insufficient accommodation is common in infants who are hypotonic. The general hypotony may involve also the intraocular muscles. Infants who later develop CP are the largest group with insufficient of lacking accommodation. Infants with Down syndrome may have insufficient accommodation and therefore need near vision glasses for communication and early learning. Children with high hyperopia may not learn to accommodate because the amount of accommodation required for clear images is so great that the infant never learns to try to accommodate. The infant becomes accustomed to the blurred image and is unaware of details in objects. This type of visual deprivation may lead to amblyopia, poor visual acuity, in both eyes if not diagnosed early. Some of these children have been diagnosed as having poor concentration and/or being hyperkinetic when they run from one place to another. At a distance an object may look interesting but at near distance is as blurred as everything else. The improvement in the child's behaviour is often momentary when the child gets proper glasses. Vision has a central role in the development of many functions. In this list are only the most important functions that it affects during the first year. We have covered communication and early interaction, motor development is the next most important function affected early if the infant is not given proper physiotherapy. The therapy should lay a good foundation for spatial concepts and orientation in space and often needs to be guided by a therapist with experience in early intervention of visually impaired infants. The role of the therapist is also important in the assessment of visual functions because she knows the infant and can perform the tests during the therapy, which the infant has learned to experience as a motivating and secure play situation. Object permanence and spatial awareness develop in play situations where the infant can effectively use his vision and combine visual information with information from other senses, as in the 'little room'. This short sequence from early physiotherapy or neurodevelopmental therapy shows how the therapist gently guides the infant to study his legs and feet with his hands. Note that the infant also looks in the direction of his feet when touching them. A few days earlier the infant had been diagnosed as blind because of the strange looking retinas and optic nerves; no functional tests had been performed. When a high contrast toy is slowly moved in front of the infant, he follows it with combined head and eye movements 180 degrees. The test toy is given to the therapist at a moment that she feels good for testing and the response observed by her, her consulting neurodevelopmental therapist (behind the camera) and the ophthalmologist. Video recording of test situations like this gives useful material for follow-up of the development. Early intervention should - by definition - start early. When there is any reason to suspect that vision is not developing quite normally, careful functional assessment should be done without delay and early intervention started to train weak functions and to teach compensatory techniques for functions that are too weak to contribute to the development of the infant. In many children there are weak or no symptoms of visual impairment in routine clinical examination of eyes. By knowing which groups of infants have increased risk of visual impairment most infants in need of early intervention are found at a correct age. Infants with increased risk are within several groups of infants: the largest group are infants with problems in thriving during the early weeks, sometimes without any obvious pathological findings, in most cases with weak or severe neurological signs of brain damage. Because of the other problems and poor general condition of the infant, sensory functions are not paid attention to until the health situation improves or the visual signs become more obvious. If an infant has a syndrome that is known to often involve eyes or visual pathways, typical signs can be looked for and visual impairment diagnosed early. It is not yet generally known that many infants with Down syndrome have insufficient or no accommodation during infancy and some of them even when they grow up. They also have large refractive errors more often than other infants. Therefore thorough examination of eyes of all infants with Down syndrome is advisable by the time of the diagnosis and functional assessment at the age of 3-6 months at the latest. Visual impairment due to disorders of the eyes or of the visual pathways should be diagnosed as early as possible. A few of them can be treated (cataract, muscles adhered to surrounding structures preventing eye movements) but in a great majority of early visual impairment there is no medical treatment and thus early intervention can and needs to be started immediately when there is suspicion of visual impairment. Ocular motor functions often reveal the condition. Fast moving eyes, nystagmus, usually means better vision than roving eye movements. Development of cognitive visual functions can be observed from early on. Visual functions to discriminate orientation of lines or size of objects cannot be measured during the first year of life. Visual information used in communication can be assessed quite early. As soon as the infant becomes interested in people around him, we can observe whether the infant responds to his family members differently from other people. Responses to expressions can be observed and recorded even earlier. 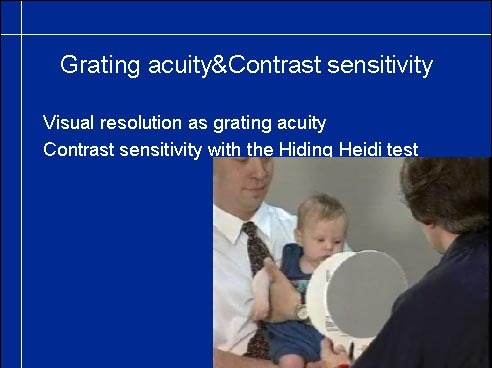 During the measurement of grating acuity and measurement of contrast sensitivity with the Hiding Heidi test, we can also observe vision for motion perception. In this short video we see the infant following the target with a combined movement of eyes and head. If an infant does not have smooth pursuit or tracking movements but makes a quick saccade to the grating when the grating stops we can suspect problems in motion perception and observe eye movements carefully during the following months. During the presentation of Hiding Heidi test same observations on ocular motor functions can be made. 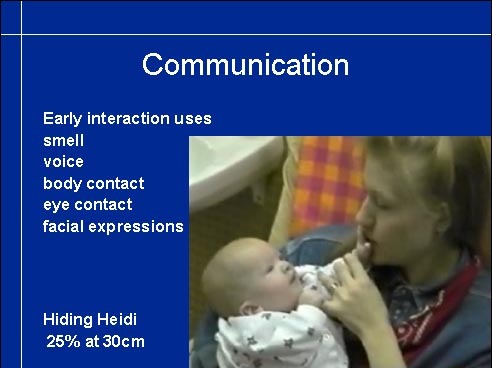 As we see in this short video sequence we can make important observations on vision for communication at the age of three months: the infant not only follows the moving target but responds to the smiling Heidi face with a smile, i.e. the infant must see the expression and is able to copy it. On the other hand, if an infant does not respond to a smiling face approaching him/her but responds with a smile to a familiar voice then we need to investigate vision for communication using videos from interaction situations. Type of fixation: If the infant has eccentric fixation, it affects communication. Accommodation and basic refractive error need to be investigated. When all these facts are known, repeated observations on the infant's responses in interaction situations are easier to understand. All findings need to be explained to the parents several times because they are difficult to understand, especially because they are emotionally important in communication. Most cognitive visual functions can be measured first when the infant is more than 18 month old, at which time colour matching and matching of abstract geometric forms often is present and eye-hand coordination and orientation in space can be observed. Increased crowding cannot be measured before the infant can be tested with line test and more crowded tests and other detail aspects of pictures and texts still later. infant's therapist(s) and vision teacher/ early intervention specialist and ask for their observations on the infant's visual functions. ...never use the phrase "We wait and see". There is always something that needs to be done at the time of diagnose and plenty to plan for the future early intervention. The infant and his/her family need help for early development and - especially - for early interaction. NEVER say "There is nothing to be done" when there is nothing surgical to be done. Assess the situation and see to that the family gets all supported services available. Having a visually impaired infant is a trauma. Be especially worried if the parents are 'fine'. It means that they still deny the situation and need more than usual amount of counselling to start thinking on their infant's way of experiencing them and the world.